A partnership agreement brought together The High Atlas Foundation (HAF) which works to establish participatory development projects for the Moroccan communities, and Siemens Gamesa Renewable Energy (SGRE), the world’s second largest wind turbine manufacturer and provides onshore and offshore wind services. Both are dedicated to working with the communities and schoolchildren in the south of Morocco, and contribute in improving the living conditions as well as to spread the importance of environment protection. Over the course of the past year, HAF and SGRE implemented a project that has been beneficial for rural communities in the Jrifia municipality of the Boujdour province, as two drinking water chateaux were constructed in Byar Triyhin and Khotot, along with pumps and meters built in the Ahl Atriah and Khotot Hbia areas. In Om Rjilat we have additionally constructed a pump and motor for drinking water. Moreover, we have jointly delivered 17 of the trash cans to Aouziouat, Toukb Jrifia, Khotot Hbia, Byar Triyeh, Mntakat Lmsmar, and Om Rjilat. With regards to solar energy, there were four solar panels installed in Byar triyh, Om Rjilat, Toukb Jrifia, and Khotot Hbia, and built a water canal of 520 meters. 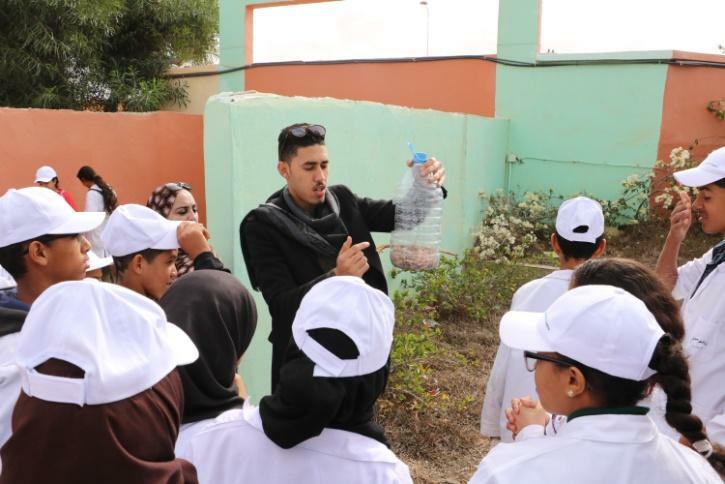 In order to make this partnership stronger and fruitful, the HAF and SGRE followed-up and came back to conduct environmental and school campaign in Aouziouat with schoolchildren, and plant hundreds of organic fruit trees engaging thousands of students. Driving 15 hours all way from Marrakech to Boujdour, a very beautiful area rich of natural resources, well known in Morocco by the best quality of fish, and a good place for the wind-energy, is an absolute exciting feeling to participate in our environmental and education mission and conduct activities with school children. The team consists of Hana Ezzaoui, HAF’s project manager in the south of Morocco, who coordinates with the schools, the Delegation of Education and local authorities before we start the week’s initiative and facilitates the workshops. Errachid Montassir, Sami’s Project manager at HAF, assists the workshops and sends reports about the activities. Ilyas Dkhissi is HAF’s filmmaker and photographer. 1- Wind turbine work and how does it works: the students split into groups and they create a model of a wind turbine. 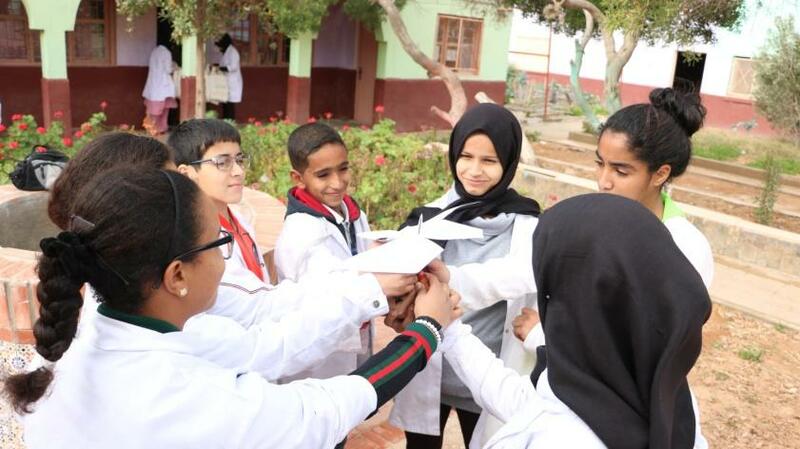 The main purpose of the workshop is to teach students how wind turbines create clean energy, especially in Boujdour province which is one of the best places in Morocco for creating the wind turbines. 2- Compost workshop: the students practice how to make compost, and learn more about its essential role in helping the trees and plants to grow in good conditions and produce good quality of fruit. This workshop explains the importance of recycling and composting, and contributes to increasing the students’ understanding of what material cannot be recycled and is toxic for the environment. And at the end of each workshop, we do a fun quiz with the students to make sure the most important messages have been understood. As we included the participatory approach to involve the students in finding out what they need more in their schools, and the priorities came as follows: 1- Fruit tress (especially olive), 2- Libaries, 3- Soccer fields. There was great participation of the students during the workshops, which wonderfully helped us to communicate better with them and finish the activities on time. This week, HAF and SGRE visited 12 schools in Boujdour province (7 primary, 3 secondary and 2 high schools), and conducted 24 environmental workshops with the schoolchildren, as we together with the kids, teachers and directors planted 3,76 fruit organic trees, seeking that 5,132 students (57 % female) will benefit from these fruit trees in the future. More activities are coming soon. 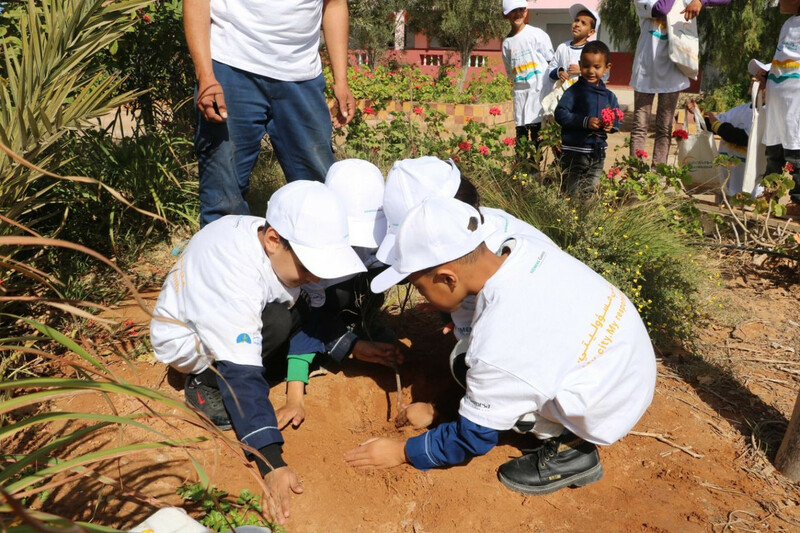 Hand in hand to contribute to the growth of the environmental education for this generation and the next one in Morocco.